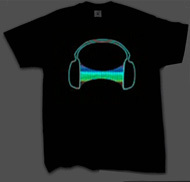 · Black cotton t-shirt with a sound activated illuminating panel. · The lights flash in blue, yellow and red in time to sound and music. · The illuminating panel is powered by a detachable battery pack, located inside the t-shirt. · The battery pack can be unplugged for washing the t-shirt. · The t-shirt is hand wash only. · The lights flash in blue and red in time to sound and music. · The lights flash in blue in time to sound and music. · The lights flash in green in time to sound and music. · The lights flash in yellow and red in time to sound and music. · The lights flash in different colours in time to sound and music. · Pink cotton t-shirt with a sound activated illuminating panel. 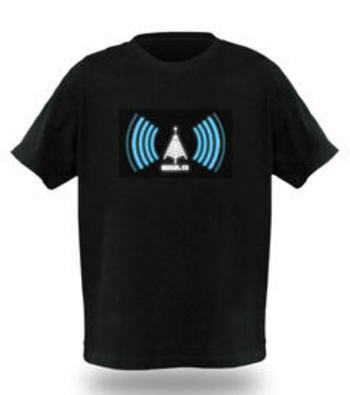 Ref.N W1 - wi-fi detecting t-shirt!